Peak Energy: Coal Seam Gas Producers - The New Masters Of The Universe ? Coal Seam Gas Producers - The New Masters Of The Universe ? Alan Kohler had an interesting column in The Business Spectator recently, in which he speculated that oil and gas producers could emerge from the credit crunch as the new financial "masters of the universe". The other big liquidity pool is Asian central banks, which are now sitting on $US4 trillion of foreign exchange reserves, up from $US1 trillion in 2001. Private equity has a surprisingly resilient pool of liquidity ($US323 billion) but the buying power of this money has contracted dramatically with the availability of debt. No, the real financial power now lies with those who are sitting on oil and gas. In Australia we have seen incredible wealth being generated out of the coal seam methane reserves in Queensland’s Surat Basin, thanks in part to a rise in the price of LNG towards parity with oil. The world’s oil-rich – including the Australian gas producers – could emerge from the bear market as the new masters of the universe. It certainly won’t be Gordon Gekko and his mob on Wall Street. While gas producers in Australia have traditionally focused on natural gas production - originally in central Australia, later in Bass Strait and most recently offshore the north west and northern coastlines - in recent months we've seen a surge in interest in coal seam gas (CSG) production and stock market valuations of coal seam gas producers, triggered by a bid by BG for Origin Energy - one of the major players in the sector - a few months ago. The bid eventually failed, with Origin instead choosing to partner with Conoco Phillips in a CSG to LNG development, with Conoco paying $US9.6 billion ($12 billion) for a half-share of Origin Energy's CSG assets. In this post I'll look at recent events in the industry and what they mean for Australian gas production in future. Coal Seam Gas - What Is It ? Coal seam gas (also called coal seam methane or coal bed methane) is trapped in coal seams (usually 300-600 metres underground) by water, which must be removed to initiate gas flow. In the past it has been viewed as more of a hazard to miners than a benefit. CSG is extracted via wells which are drilled down into coal seams - the water is pumped out and the CSG is then released (desorbed) from the coal. If the pressure within the seam is high enough the gas may flow to the surface unaided, otherwise the gas must be pumped. Various techniques have been developed to enhance the rate of desorbtion, including the pumping of carbon dioxide underground to increase field pressure (which leads some CSG promoters to describe it as a form of "clean coal"). Like shale gas, coal seam gas is often called "unconventional gas" and seems to have been overlooked as an alternative to natural gas until recently. The technology for extracting gas from coal seams was originally developed in the United States, though in recent years Australian companies have enhanced the technology considerably. Coal seam gas producers in Queensland's Surat Basin claim their gas contains more than 98% methane, with very small amounts of nitrogen and carbon dioxide, and is therefore "cleaner" than natural gas alternatives. However a recent JPMorgan study found that CSG projects actually had higher emissions than some offshore natural gas developments, so it appears that this varies on a case by case basis. "The lowest emitting project according to our estimates is the Pluto project, whereas the highest carbon emitting project is the Browse LNG project," analyst Mark Greenwood said. "We were surprised when we worked through the details that the coal seam methane LNG projects, which contain negligible CO2, do not have the lowest CO2 emissions." In my recent post on Australian natural gas supplies, I mentioned that the big unknown when estimating reserves is the amount of coal seam methane (CSM - also known as coal seam gas or coal bed methane) that can potentially be extracted. 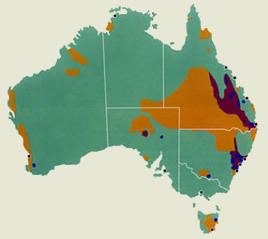 The coal seam gas sector has been pioneered in Australia by Queensland Gas (QGC) and Arrow Energy, with Origin Energy and Santos also emerging as major players, along with a host of smaller competitors - primarily in the Surat and Bowen basins in Queensland. Exploration is now expanding to the Galilee Basin and Millungera Basin in Queensland, the Gunnedah Basin and Clarence Morton Basin in NSW and regions in other states like Western Australia. Some international players like Conoco, Amoco and Enron have also tried to become CSG producers, without success. * The failed bid by BG (British Gas) for Origin Energy, the largest local CSM producer. Origin instead did a $9.6 billion deal with ConocoPhillips acquiring a half share in Origin's CSG assets. * Petronas acquiring a stake in Santos' planned CSM to LNG plant. * Shell buying a stake in the CSM gas projects of Arrow Energy. * QGC making a $900 million bid to buy Sunshine Gas. Smaller CSM operators like Beach Petroleum have been pondering their now substantially enlarged valuations and wondering if "prices might have been blown out of proportion". CSG currently accounts for around 15% of gas production in the eastern states (and over 70% of production in Queensland). According to consultants EnergyQuest, CSG production is growing rapidly, as are proven and probable reserves. "In less than five years the east coast has gone from facing a looming gas shortage to having more than enough gas to meet local demand and export overseas," EnergyQuest CEO Graeme Bethune says. Output in the June quarter rose by 34 per cent to 36.9 petajoules on a year-by-year basis. Over the year, proven CSG reserves have almost doubled from 6600PJ to 12,400PJ. Oil companies like AWE are also considering expanding into the CSG sector. Total coal seam methane reserves in Australia are hard to get a handle on - The Australian claims that "as a guide, Queensland now has bigger estimated reserves of gas than offshore Western Australia", though they fail to quantify this or point to a source for the data. The SMH says "analysts believe the state might ultimately hold just as vast resources of coal-seam gas as [Queensland]". Notes: Reserves announced up to 1 January 2007. The Business Spectator had some numbers in this article on Phil Mathews ("Australia's peak oil billionaire), claiming Santos alone has 100 tcf of CSG (in comparison, Australia's proven natural gas reserves are around 150 tcf). Santos recently said it likely has a 40 tcf resource in the Gunnedah Basin alone. That stake in Santos is worth $660 million. Mathews told me this morning that his main fund – called the Sabre Fund - totals $2 billion, and there are two others in his stable worth a total of $1.5 billion, called the Tomahawk Fund and the Velocity Fund. So he has a third of his main fund in Santos. This is a man who likes a big bet. Eastern Star Gas estimates that resources of CSG in Queensland and New South Wales are more than 250 Tcf. 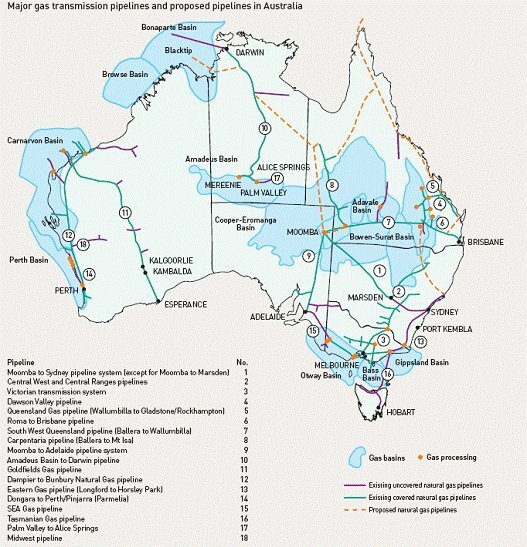 The same figure is quoted in this interview with Belinda Robinson of the APPEA. The 250 tcf number is also quoted by Arrow Energy's CEO Shaun Scott, referring to an estimate from the CSIRO. Certainly in Queensland as you know there's lots and lots of coal. Coal seam gas is really created at the same time the coal's made. So, you know, coal exploration's been going on for a lot longer than coal seam gas so we know a lot about coal and where it is and the properties of it and we know there's gas in it. So I think, you know. From a resource potential. It's enormous, CSIRO I think estimating in Queensland somewhere between 250 to 300 trillion cubic feet of resource exists in coal seam gas. Santos CEO David Knox is also quoting the 250 tcf figure for Queensland, though he quotes ABARE rather than the CSIRO. ABARE has said there's 250 TCF of gas in eastern Australia. ... Whether there's 250 [TCF] still has to be proven. Right now our proven resources are much smaller than that. I came across the CSIRO study mentioned about 3 years ago, but my bookmark has succumbed to linkrot and I've been unable to find the paper on a recent search. The CSIRO is also investigating if injecting microbes and carbon dioxide into coal seams can produce commercially viable quantities of methane. Using coal seam methane for LNG is a new development - until now this hasn't occurred as the gas does not contain the higher value liquids (LPG and condensates) that can offset the high capital cost of an LNG development. Rising LNG prices seem to have changed this equation, with the cost of producing LNG from CSG estimated to be around $2.60 per gigajoule while (according to The Australian) Asian customers will pay around $12 per gigajoule. Several LNG project development proposals have been made for sites at Gladstone in Queensland by a number of groups, with 5 major projects currently under consideration. * Origin Energy and ConocoPhilips plan to build a 7 million tonnes per annum LNG plant, which they hope to eventually increase to 14 million tonnes, with first shipments starting in 2014. By way of comparison, he east coast of Australia currently consumes about 9 million tonnes each year. * Santos and Petronas are proposing to develop a 3—4 mmtpa LNG plant costing around $7 billion and commencing operation in 2014, which they would like to eventually increase to 8 million tonnes. * BG and QGC are also proposing a 3—4 mmtpa LNG plant costing around $8 billion which they hope to eventually increase to 12 million tonnes. The first shipment is expected in 2013. * Arrow and Shell are working with LNG Ltd to a proposed 1.3 mmtpa LNG facility (though doubling the capacity is under consideration) at Fisherman's Landing. Arrow Energy plans to build a pipeline from Moranbah to supply the gas. The plant has been delayed by the credit crunch, with LNG looking for more equity to compensate for frozen debt markets. * Sunshine Gas is working with Sojitz to develop a 0.5 mmtpa LNG plant. Production is planned in 2012. Sunshine is the subject of a takeover bid from QGC, which would remove this project from the equation if successful. Extracting gas from coal seams requires a lot more drilling than extracting conventional natural gas, which has led existing Australian LNG exporter Woodside to downplay the likelihood of competition emerging on the east coast. Woodside's Don Voelte is on the record as saying that not only does he know a bit about coal seam gas but he doesn't think much of it. He told ABC television in July: "No LNG plants have been built based on coal bed methane. It takes literally thousands of wells. There are a lot of issues around. It's a low quality gas. We've looked at it. We have an opinion about it, and we're pretty happy with our gas." Regarding the "low quality gas" jibe, both Arrow and QGC are both claiming their is no difference in gas quality and that Japanese customers are very interested in buying LNG from the projects when it becomes available. Richard Cottee: This is a very unusual situation for the Australian gas market in the sense that it’s actually not market constrained. The demand for LNG is highly elastic. For example LNG demand in China is presently 3 million tonnes per annum and projected to go to about 30 million tonnes per annum by 2020 which in the context of Japan, which at the same time will be 80 million tonnes per annum, shows that obviously the demand’s not the issue. The real problem I think is going to be market acceptance because this is the first…this will be CBM and it’s the first time that that’s actually going to be used for LNG. AK: What do you mean by that? 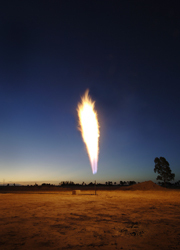 RC: Coal-seam gas or 'coal-bed methane' – CBM. It’s the same concept. CBM is the American term...we’re divided by a common language so we had to invent our own acronym for it. AK: And what do you mean by market acceptance? AK: You’re saying that coal-seam methane is not appropriate for domestic use? RC: I am saying it is appropriate provided you get the right customer who will then commingle it with other energy. Obviously that means you’re talking about big customers or if you get into a new market like China, then they will be more likely to want to build at the leaner end… because of the less pollution that the pure gas will provide. The Business Spectator notes that the economics of unconventional gas are "radically different – but not necessarily either inferior or superior – to conventional gas". A recent comparison of conventional LNG projects with coal seam gas projects by Deutsche Bank analysts illustrated the differences neatly. They compared Woodside’s Pluto project with Santos’ Gladstone LNG (GLNG) project, which will source gas from its Fairview resource. Pluto will drill five wells to support its initial LNG production. GLNG will drill 540. Pluto will increase its number of wells to 8, while GLNG will be adding about 60 wells a year. The ramp up period to first production is about five days for Pluto, but two years for GLNG, while production per well is about 120 million cubic feet of gas a day for Pluto and only about one million cubic feet per well for Fairview. Total production for Pluto would be around 614 million cubic feet where Fairview is expected to produce 526 million cubic feet. So, at face value, coal seam gas involves far more drilling for significantly less production and, because coal seam gas contains no liquids, significantly less valuable production. The capital expenditure on the upstream phase of the development to bring Pluto into production, however, is about $5 billion, whereas Fairview will cost only about $1.2 billion – that’s the difference between an offshore development and an onshore project. Moreover, where Pluto faces a petroleum resource rent tax rate of 40 per cent, as an onshore project Fairview will only pay royalties of 10 per cent – the upstream tax take, the analysts say, will be $6.7 billion for Pluto but only $2.3 billion for Fairview. As Santos says, the growth in Australian coal seam gas production is following a similar path to coal seam gas in the US, although average production from the Queensland fields is substantially greater than from the average well in the US – Santos says the Australian resources are of better quality than those in the US. The downside for eastern states gas customers is that once local gas producers have an export market it is likely that domestic prices will rise towards those paid by overseas customers. This may result in some mild form of resource nationalism being adopted, similar to the law passed in Western Australia that mandates 15% of production be reserved for the local market. In 2000, the then Beattie government in Queensland mandated that 13% of the state's electricity be sourced from gas by 2005 (this has since been raised to an 18% target for 2020). At the time, this was believed to be an incentive to build the planned Papua New Guinea gas pipeline (which has since been cancelled, with an LNG development in PNG likely to ship gas to Asian markets instead). During this timeframe CSG explorers kept proving reserves in the Bowen and Surat Basins and signing agreements to supply gas-fired power stations, while existing sources of gas supply, such as Bass Strait and the Cooper Basin, have plateaued. As a result, construction of gas fired power stations using CSG is booming, creating what one ABC reporter termed a "carbon war" between coal and gas for power generation. As gas fired power emits around half the carbon dioxide that coal does (leading the APPEA to market it as a "transition fuel" to a low carbon economy), it seems likely that gas will win in the medium term - especially if the proposed Emissions Trading Scheme is implemented. * Origin is building a 630 MW air cooled, combined cycle power station at Darling Downs using CSG. * Origin is also planning a 1000 MW combined cycle power station at Spring Gully, colocated with a CSG development. * Anglo Coal has opened a 32MW CSG fired power station at its German Creek mine in Queensland. * QGC is planning a gas-fired power station in the Hunter Valley (and an accompanying $850 million pipeline to bring gas down from Queensland). * Energy Developments is building a 40 MW plant at the Monanbah North colliery, using coal mine methane. * Various other CSG companies, including Arrow and Eastern Star Gas, own or operate smaller power stations using CSG as feedstock. * Metgasco is building a 30 MW CSG fired power plant at Casino in northern NSW. * Delta Energy is building the 667 MW Colongra plant at the existing Munmorah coal fired plant site in NSW. This plant is an open cycle peaking plant rather than a (significantly more efficient) closed cycle plant than can run continuously - apparently because gas supplies in NSW are so limited that they couldn't obtain the necessary gas volumes for full time operation (the plant can operate around 5 hours per day, with gas stored in a giant pipe that snakes around the complex). * TRUenergy is building the 400 MW Tallawarra combined cycle gas power plant near Wollongong in NSW. * Babcock & Brown has built a 640 MW open cycle gas power plant at Uranquinty, near Wagga Wagga in NSW. At one point Santos had a project proposed called Fairview which would have used coal seam gas to run a power station at Injune in Queensland, which was to sequester the carbon dioxide produced in order to qualify for funding from the Federal Government's low emissions demonstration fund, however this development has fallen through on economic grounds (like many other proposed clean coal initiatives over the years). The Business Spectator claims that one problem with drilling for CSG is that once the gas is flowing, you need to use it, which is a positive for power generation until the planned LNG plants are online. The major issue not getting much attention is the big difference between CSG and regular natural gas is that with the latter, once discovered and proved up, you just turn off the tap until you want to go into production. With CSG that's not possible. You can tweak a bit, but essentially the gas will continue to flow whether you can use it or not. All but one of the LNG/CSG plays have a looming issue with ALL the gas they're proving up for their large LNG trains will be next to useless to them until those trains come onstream. Arrow is best placed as it has under capacity in it's electricity plants, with more being added, so it can divert the gas that will eventually go to LNG to the electricity plants. They will probably be able to buy some of the useless gas off the others as well. This is why they went the smaller model route. They will be in production well before any of the bigger players and they don't have to prove up as much gas on the way. One issue facing CSG based power generators is a lack of transmission capacity, with Queensland grid company Powerlink estimating that $2.9 billion will need to be spent extending the grid over the next five years to handle CSG and renewables powered generation (expansion of the grid - and generation capacity - in Queensland and NSW in particular is urgently required after decades of under-investment and rapidly rising demand). If some of the geothermal power projects in outback South Australia are successful, this additional grid investment could be the first step towards a Queensland - South Australia interconnector and eventually a national electricity grid (ideally linking in some large scale solar thermal power stations as well, like the ones proposed by Worley Parsons, and perhaps some ocean energy plants like the ones proposed by Carnegie Corp). The process of extracting coal seam gas produces large amounts of (non-potable) water as a by-product - as an example, QGC estimates that it will be producing 100 megalitres of water a day at its Condamine field in south east Queensland within a decade. Waste water is often one of the drivers for groups opposing the development of CSG projects. The Queensland government has commissioned a feasibility study into the use of this water for agriculture and industry purposes, looking at treatment and transmission costs. Queensland farming lobby group Agforce has been unenthused by the prospect of using CSG waste water for agriculture - and warns that salt and other contaminants could do serious environmental damage if not treated properly. AgForce water spokesman, Kim Bremner, says an environmental disaster is also waiting to happen and the companies chasing the gas need to be held accountable and responsible for ensuring this is averted. "The prime agricultural land on the Darling Downs is essential for Queensland's future food supplies and should not be compromised by an extractive industry that is building multiple pipelines and vast evaporation ponds across the landscape but may only be around for 20-30 years," Mr Bremner said. "The evaporation ponds popping up all over the Downs will have long-term ramifications on farmland availability as well as the quality of soils, ground water in aquifers and flood plain areas. Condamine Alliance figures predict that if all proposed coal seam gas development goes ahead, there will be 50,000 hectares of evaporation ponds. This will result in millions of tonnes of salt across the landscape. From just one small field south of Dalby, it has been estimated more than 400,000 tonnes of salt will be brought to the surface with the associated water." According to AgForce, each megalitre of coal-seam gas water has between 1300 and 9000ppm salt, compared with normal river water which is 250ppm. Cattle cannot drink water with more than 2000ppm and on certain soils that level of salts can destroy the land. Origin has opened a reverse osmosis desalination plant at Spring Gully which can process nine megalitres per day, which should overcome some of the fears, but there are still questions about what will be done with the salt and other impurities. Origin is also planning to use water produced at the site to cool its Spring Gully power plant, which seems to be a way of solving both the waste water problem and the problems obtaining water experienced by other Queensland power stations in recent years. In my post on Australian natural gas reserves I noted that fossil fuel exports form a large and growing proportion of the Australian economy, and that we are at risk of contracting what is known as "the dutch disease". Another impact of the LNG export industry is that it will further increase the nation's dependence on income from fossil fuel exports. Coal is currently our major export earner, which has prompted concern about Australia suffering from what is known as "The Dutch Disease" - the theory that an increase in revenues from natural resources will deindustrialise a nation’s economy by raising the exchange rate, which makes the manufacturing sector less competitive. The term was coined in 1977 by The Economist to describe the decline of the manufacturing sector in the Netherlands after the discovery of natural gas in the 1960s. With the value of gas exports likely to rise to a similar level to that of coal if all the planned LNG projects go ahead, we could see more than a quarter of national GNP coming from these 2 industries. A large Queensland LNG export industry based on coal seam gas will obviously further exacerbate this risk, as the economy becomes even more heavily weighted towards resources. Another process for extracting energy from coal seams is known as underground coal gasification (UCG). UCG is being trialled at Chinchilla on Queensland's Darling Downs by a company called Linc Energy, which is using the process to produce syngas, then converting the syngas into liquids using the Fischer Tropsch process (ie. a coal to liquids project). The company is claiming it can produce syngas for about 70c a gigajoule, which The Australian claims is "causing some discomfort for Queensland's coal seam methane producers". The company also claims UCG produces 20 times more gas for a given volume of coal than CSM can. However, the Queensland state government has concerns that the UCG process may be more environmentally unfriendly than CSG extraction, and is "putting the brakes" on the industry while it asks Linc to prove that its process does not contaminate groundwater. While some skeptical observers seem to think that this may be a case of the CSG / LNG industry using the state government to minimise competition for coal tenements, it would seem possible that UCG could be performed on coal seams after the CSG has been extracted, thus enabling two bites to be taken of the cherry (which wouldn't be the case if UCG was performed first). I'm just speculating here though - any better informed comments are welcome. UCG projects are being considered outside Queensland - one recent proposal talked about using coal deposits offshore from NSW. Coal seam gas has appeared in national gas reserve estimates for the first time this year. Solid Energy is exploring for CSG on the North Island, with 300 PJ of gas estimated to be available in the Huntly field. L&M Petroleum has been exploring for gas on the South Island, with encouraging discoveries so far leading to estimates of around 300 PJ of gas. Coal seam gas is also produced in the United States and Canada. The US Geological Survey estimates there is more than 700 tcf within the US of which at least 100 tcf is economically viable to produce. The Economist recently noted that American gas production grew 4.3% last year, and by 9% in the first quarter of this year and quoted a CERA spokesman claiming that this spurt will delay America’s emergence as a big importer of LNG by a decade. One report, "Overview of Unconventional Natural Gas and its Impact on Supply" (pdf) estimates that 300 tcf are technically recoverable and that 110 tcf could be produced by 2020. Known Canadian resources are of the order of 300 tcf. There are also reports of Asian reserves of around 2,100 tcf - including 1,000 tcf in China, where the government is looking to rapidly increase production. There is also interest in CSG production emerging in India, with reserves estimated to be around 16 tcf, and in Indonesia (Sumatran resources are estimated to be 240 tcf), where there is talk of building CSG LNG plants in Kalimantan in future. Old coal mining regions in Europe may also get in on the act, with some people in Wales already talking about setting up a sovereign wealth fund to handle potential revenues from coal seam gas production in the valleys (maybe getting just a little ahead of themselves). While the idea that the the merchants of coal seam gas will become the new "masters of the universe" seems unlikely, there is no doubt that the past decade has seen a rapid turnaround in the fortunes of the energy compared to those of the financial industry (an event which recurs periodically, if you view history through the right lens) and that coal seam gas is likely to become a significant contributor to the Australian economy. When I looked at Australian natural gas reserves alone, I concluded that we could ramp up LNG exports, increase domestic gas consumption for power generation and use CNG for vehicles, and still have enough gas to last around 4 decades. If the estimates for coal seam gas reserves of over 300 tcf are correct, then we may well still be using gas in Australia on a large scale 70 years from now - assuming global warming hasn't worsened to the point that all carbon emissions are banned entirely of course. Other countries with large coal resources (particularly the US, China and India) would seem likely to increase CSG production over time as well. It would be interesting to see any studies that have estimated the global potential for CSG and what effect they have on the peak production point for gas, as the gas depletion models I've seen seem to focus exclusively on natural gas. Peak Energy - Australian Natural Gas - How Much Do We Have And How Long Will It Last ? The Oil Drum - Will Unconventional Natural Gas Save Us? The Oil Drum - Can US Natural Gas Production Be Ramped Up? Peak Energy - Queensland's Shale Oil Billions in The Balance ? Cross-posted to TOD ANZ (where there will hopefully be come discussion).